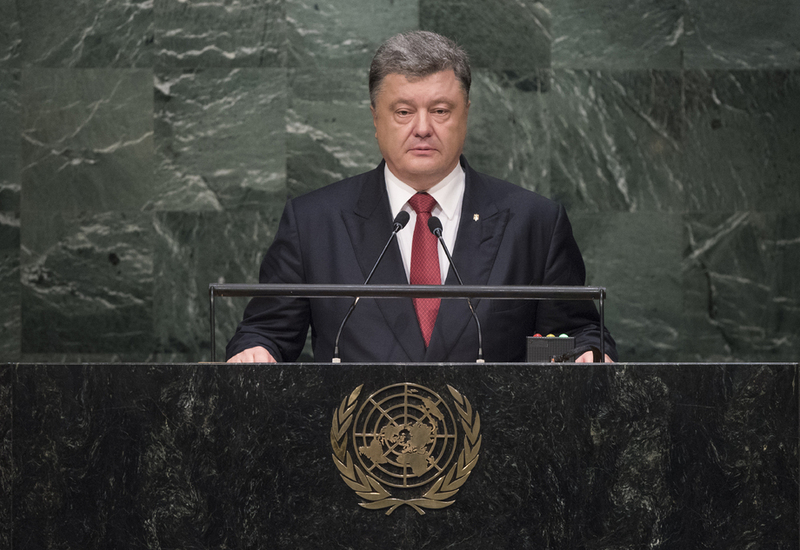 PETRO POROSHENKO, President of Ukraine, said his country had contributed actively in the shaping of the United Nations Charter at the San Francisco Conference of 1945 and was now suffering from a brutal violation of that document’s principles. The aggressor was the Russian Federation, a neighbouring country and former strategic partner, and a member of Security Council, which had conducted an open aggression against Ukraine by occupying Crimea in February. After the General Assembly resolution condemning that annexation, Moscow had started a new military gamble, this time in the Ukrainian Donbass region. In the last few days, the Russian Federation had called for the establishment of an anti-terrorist coalition and warned of the danger of flirting with terrorists. “How can you talk about an anti-terrorist coalition if you inspire terrorism right in front of your door?” the speaker asked. The Organization, he said, lacked an effective instrument for bringing the aggressor country to justice. Seventy years ago, when the creators of the Charter had envisaged Security Council sanctions as a restraining tool, they could not have imagined that it would be needed against a permanent member of the Council. Since the beginning of the aggression, the Russian Federation had used its veto right twice, when the Council was considering questions relating to Ukraine. Veto power should not become an act of grace and pardon for a crime. Welcoming the initiative of the French President to restrain veto use in cases of mass atrocities, he said that primary attention should be given to modernizing the Council, by enlarging its membership and improving its working methods. Strongly condemning terrorism in all its forms, he added that the International Court of Justice and International Criminal Court should be given a special role in combatting international terrorism. Turning to the Sustainable Development Goals, he said that his country, as a member of the “Friends of Climate” Group, was looking forward to reaching consensus on the matter this year in Paris. The Russian aggression had caused another challenge for Ukraine in the protection of Donbass’ environment. Irresponsible and criminal flooding of mines by terrorists had poisoned the region’s drinking water, soil, flora and fauna. Next year would mark the thirtieth anniversary of the Chernobyl nuclear tragedy. Ukraine requested that a special meeting of the General Assembly be dedicated to that in April 2016.